The City of San Leandro is once again partnering with Streets Alive! to artistically enhance utility boxes throughout the city. The Streets Alive! 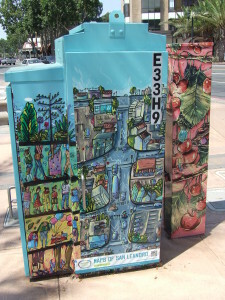 team is looking for local San Leandro or Alameda County artists and community members who are interested in exhibiting their artwork on a box. Selected artists will be compensated for their work and their art will display on locations around the city. By installing artwork on utility boxes in San Leandro, we create a platform for storytelling and communication, transforming unattractive, obtrusive utility boxes into vibrant art pieces and a topic of interest for the community. The initial pilot project was a great success, and the City is pleased to expand the program to additional locations. Want to have your art featured on one of the boxes? Apply now! Submissions are due by January 19. Survey link does not open even with copy and pastes. Help. My comments are the same as Cynthia Rose. I’d be happy to do it if I could get to it. Please help.